Thanks to Wikipedia for this information. This was the territory I was planning to head to on my mini desert adventure. 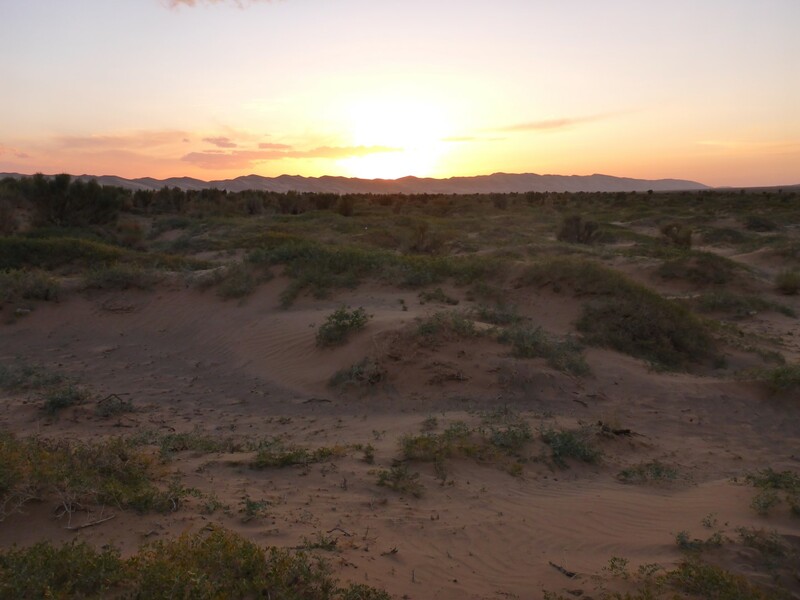 My first destination was to be the Hongorin Els, the largest sand dunes in the Gobi. 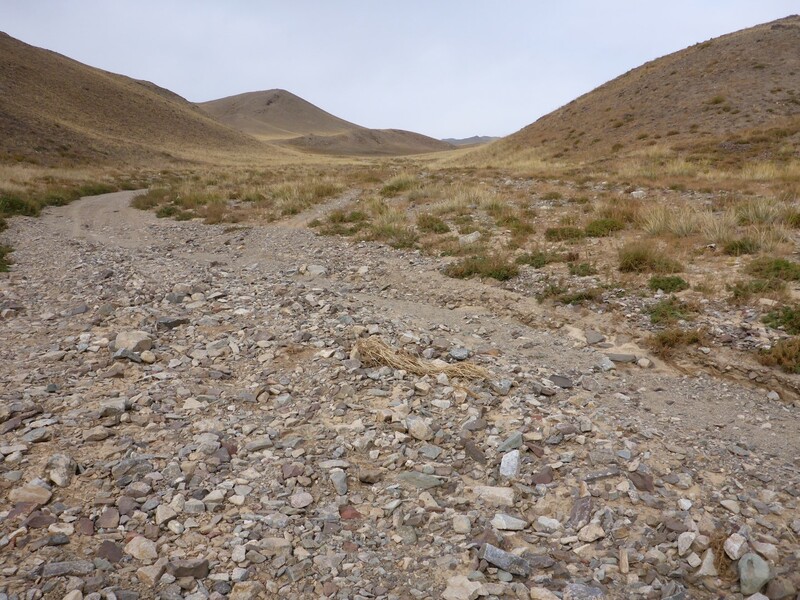 Afterwards I had a route planned that would take me northwards, across country and back to Arvayheer, and then further north towards Khakhorin, where lie the ruins of Mongolia’s ancient capital, Karakorum. When I left the hotel I had three beer bottles hanging off the back of the bike, ready to be filled up with the extra fuel I needed. The plastic caps had small handles on them which I’d passed my luggage straps through. It must have looked really weird but I wanted to fill them before I strapped them on properly. At the garage the woman there looked at the bottles and made a crossed throat gesture, clearly indicating that she wasn’t going to be putting petrol in them any time soon. So what happened to all those tales about intrepid travellers carry their spare fuel in old Coke bottles? Ah, maybe she was teetotal and didn’t like me using beer bottles? Or perhaps the authorities had clamped down on such antics. Either way, I now had no way of carrying the extra fuel. There were three guys at the garage, all laughing like drains at the sight of me – and I have to say I don’t blame them. Eventually one of them calmed down enough to find me an empty four litre oil can, which I got filled, so I had some extra fuel although not quite as much as I had wanted. 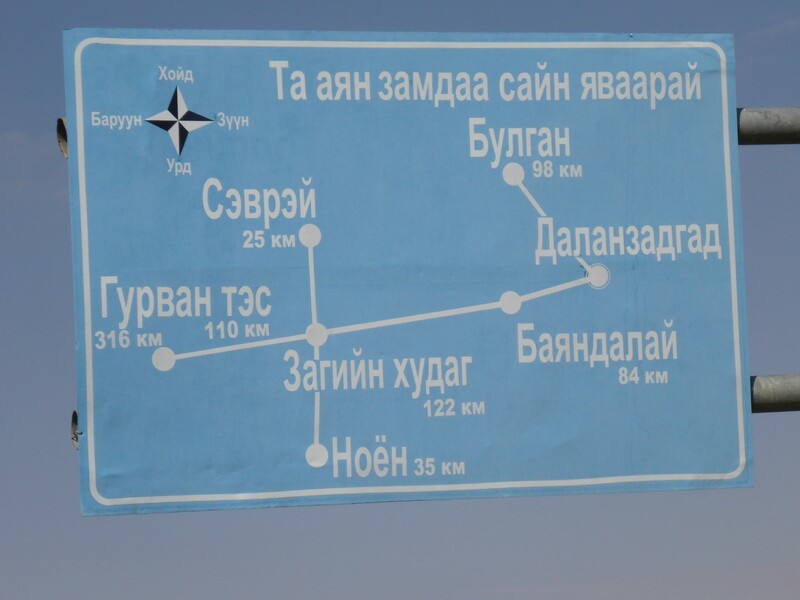 However they did confirm there was fuel in Bayandalay, the next town down the road. I never did work out what this signpost meant. Leaving behind some highly amused Mongolians, I took the same road out of town as had taken me to Vulture Gorge except that this time I didn’t turn off. When the asphalt turned to gravel at the roadworks, I followed it. I saw several tankers parked on the top of a hill and had already passed two, and I concluded their role was to supply the roadworks vehicles. 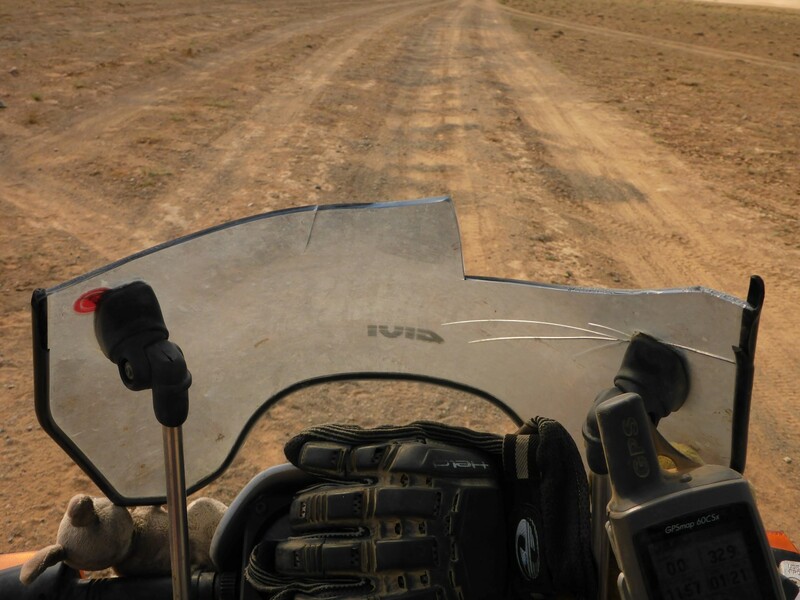 At Bayandalay I topped up the tank then took to the track that led to the dunes. As predicted by one of the people at the hotel, the track began to cross plenty of dried up waterways. In fact it was criss crossed with them and my speed dropped right down. 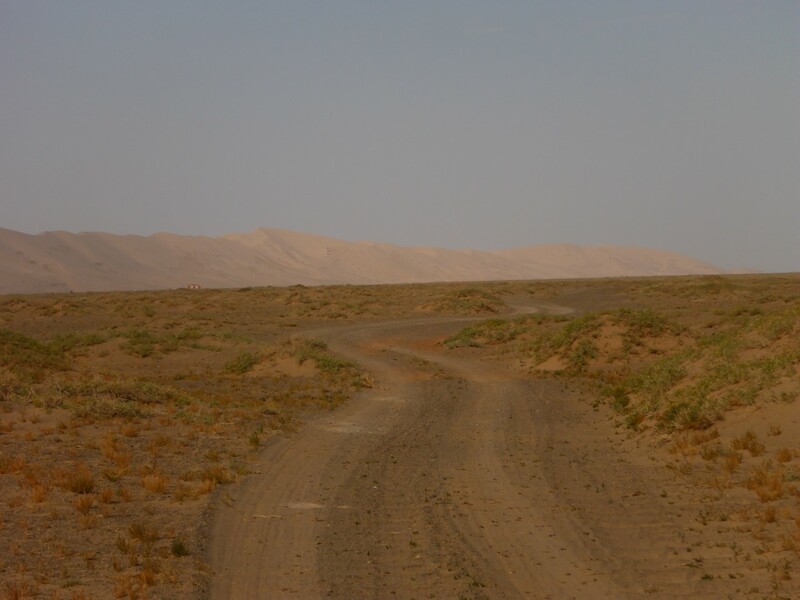 Most of the terrain I was to cross fell within the Gobi Desert but as described above, would not necessarily be sandy. But the route out to the dunes definitely was, and became tougher as I got closer. About 72kms out of Bayandalay I came to a clearly defined track that turned off due north, the direction I needed to go next day. It tied in with the information on my map so I way-marked it on my GPS to make sure I could find it again. 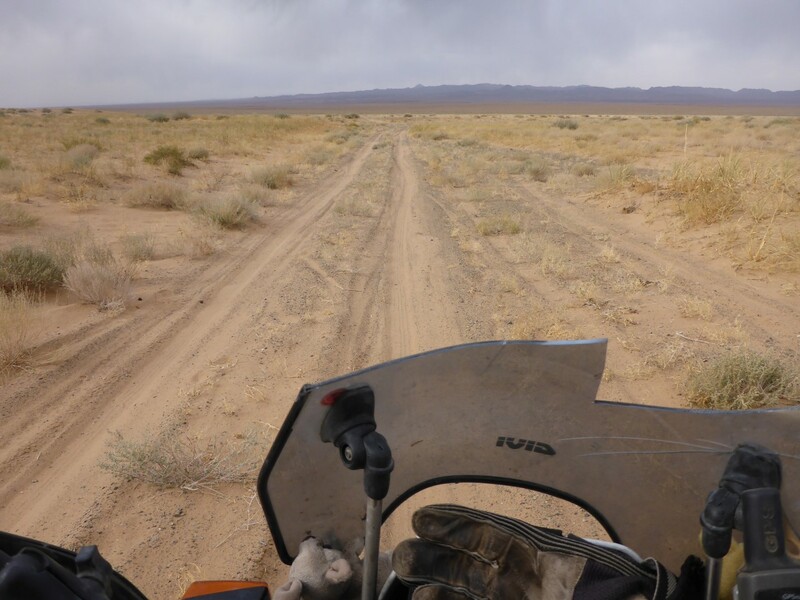 I was quite confident I would because, unusually for Mongolia, the track to the dunes was quite easy to see on the ground with not too many alternatives. But it was a tough one, with those deep and dry waterways to find a route across and evermore encroaching sand into what had been stone and some grass. 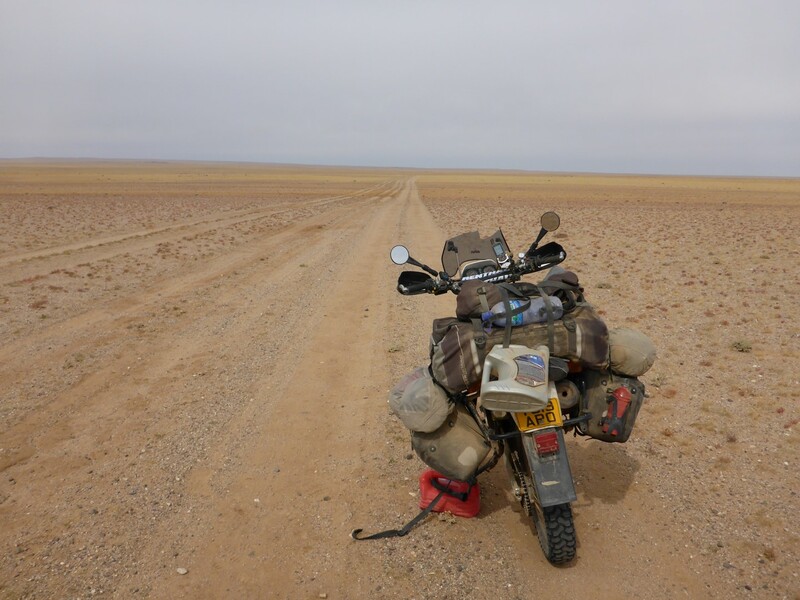 I dumped the bike in loose sand three times in quick succession, each time needing to remove my bags from the back of the bike before I could pick it up. One of my mantras when choosing this bike was to only take one that I could pick up by myself. 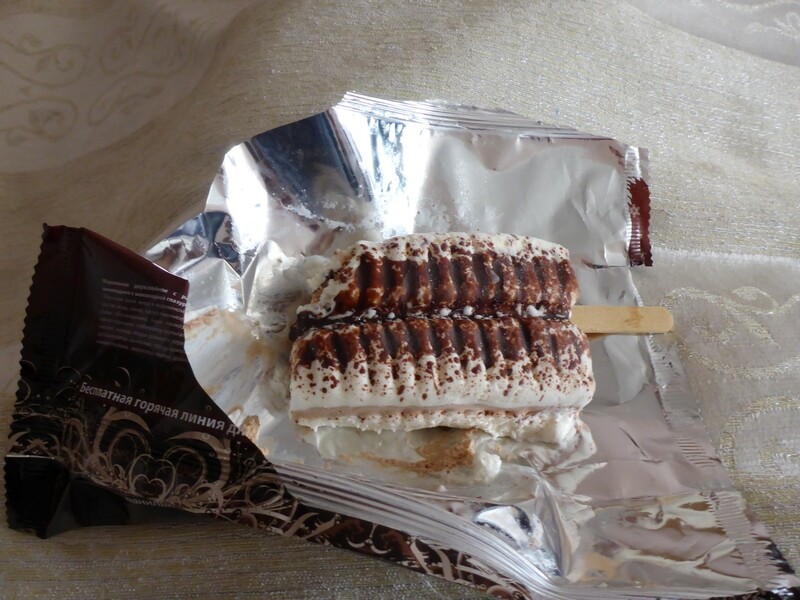 I became very pleased that I had stuck to that. The first ‘off’ of my Gobi trip. Sadly, not the only one. As I neared the dunes, now getting ever taller, I came to several tourist Ger camps. I stopped at one of them but no one was around. I pushed on past them, dropped the bike for a fourth time and decided I’d had enough for the day. The sand around me was mostly hard packed so I found a fairly stone free area and pitched my tent. The day had been warm but it was colder now and dark by 19.30. I took some photos of the high dunes, not all that far away from me, and settled down for the night. 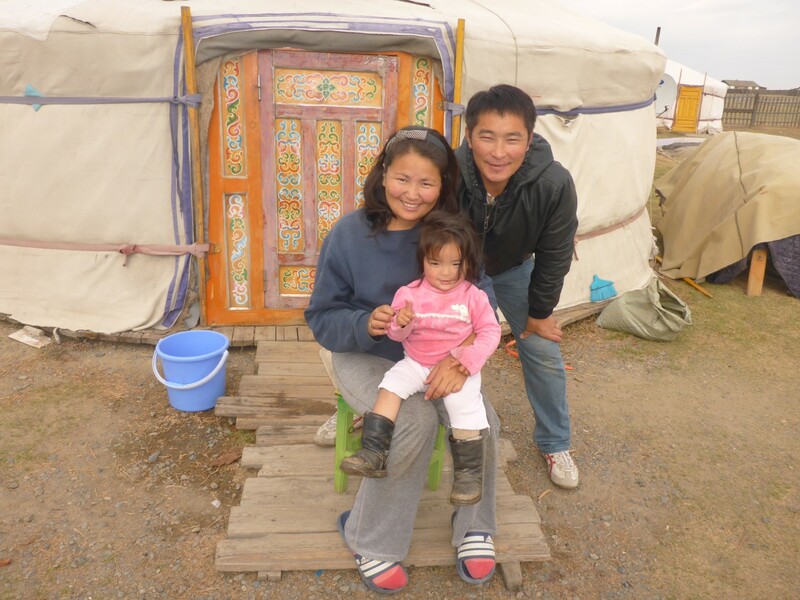 On each Mongolian camping occasion so far, I’d had some Mongolians come to visit to check me out. This time, despite being quite close to several large camps, I was left alone. Just the scuttling sounds of the desert animals to keep me company. Too many other tourists for me to be an object of curiosity I suppose, but I’m not complaining. It was chilly but sunny when I woke up and I still wanted to get right down to the dunes. I loaded up and set off down the track and within 500 metres I was sprawled in the sand once again. Bugger! I tried to pick the bike up without removing the bags off the back and nearly did it. But only nearly. The end result was that in the process I overbalanced and leaned across the front of the bike. My full weight was now on the screen and I snapped it into three pieces. Double Bugger!! 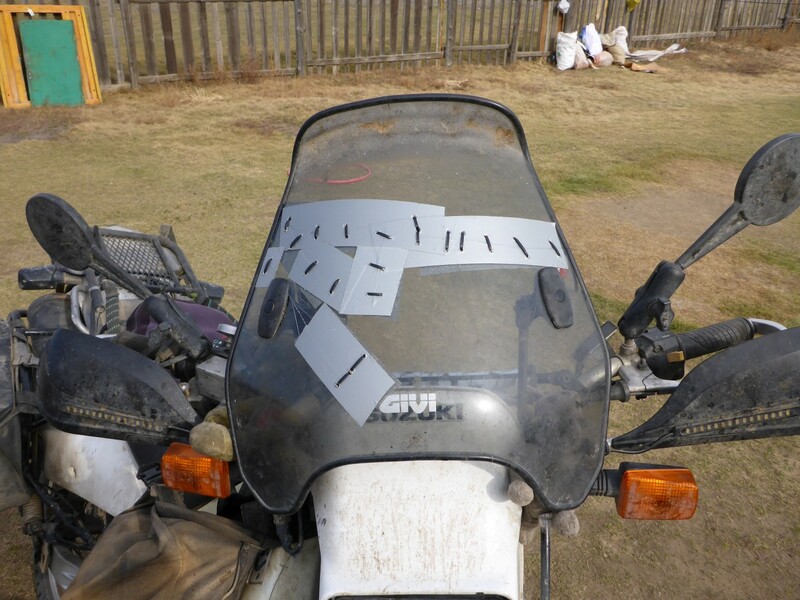 The screen was one of the items I’d added to the bike to improve the riding conditions. It kept wind and rain off me to a surprising degree and helped make those long road miles much less tiring. Now, due to my own stupidity (I should have taken the bags off) it was broken. It would have been tempting to hurl the pieces as far away from me as my strength would allow in a moment of anger, but I had enough sense to stow them in my panniers for later assessment. By now my ambition to get to the dunes had somewhat faded. A Mongolian came along, obviously connected to one of the tourist camps as he could speak some English. ‘Where the hell were you when I needed you?” was my immediate thought. But I asked him how far the dunes were and what the track was like. “Ten Kilometres and sandy” is the summary of his reply. Decision made. I turned back and found the track that would take me back to my northward turn off and got stuck in to staying upright. I’d seen the spectacle of the dunes, albeit from a distance. It would have to do. This was as close as I got to the Hongorin Els, about 10kms away. You might wonder how it’s possible to keep coming off under the same circumstances without learning how to avoid it. I know I did. But a new day and some fresh determination got me across the same terrain that I’d ridden yesterday and this time the horizon remained where it was supposed to. I was even able to see some of the marks I’d left in the sand as I fell. I mentally gave them the finger as I rode past. Keeping in line with the direction my GPS was telling me to go, I was nearly at my northwards turn off when I saw several 4×4’s parked at the side of the track. I stopped to say hello to a crowd of tourists. Half a cup of coffee was shoved into my hand, along with a very welcome biscuit. We chatted for a while and I discovered they were all Israelis here on holiday and out in the desert to see the sights. They’d been to the dunes and were now heading for Vulture Gorge. They were keen to hear about my trip, and I theirs. Theirs had been organised by an Israeli who arranges adventure holidays to various places around the world. Most of them were around my age, some younger, and they came across as a nice bunch of people. I thanked them for the snack and carried on, lifted by having met some nice humans out in this wilderness. I soon came to a main track that branched off in the direction I needed and then joined up with the one that I’d way marked. Things were looking up! Things went well for a while until, after about 25-30kms, the track petered out just past a group of Gers. “No problem,” I thought, “I’ll just keep following the compass bearing until I get to another track, same as I’d done before.” Oh dear. Just how badly was that about to turn out! Heading north. Good, fast riding. Just follow the compass. Things weren’t too bad at first but the ground soon turned from grass to sand and then to miniature dunes with large clumps of tufted grass on them. Before long the small dunes were joined by larger ones. There was the occasional single wheel track in the sand that I could follow but they never lasted long. I fell off too many times to count – 3 or four at least – and eventually I got Doris stuck by the rear wheel in deep sand at the foot of a steep dune. Stuck in the sand. Muscle power and sweat required! The clutch was starting to overheat, even more than I was, so I took the bags off the back and carried them up to the top. Then I hauled the bike out backwards, dragged it around to face the way I needed to go and rode it to the top of the dune. There was a part of me wondering if I’d ever get out of the mess I’d ridden myself in to but there always seems to be a bigger part of me that is confident enough to believe I will. And I did! It was bloody hard work but I just kept working my way across the dunes heading for what looked to be a track in the distance. I tried to be gentle on the clutch as that episode in the sand had heated it up quite a bit and the cable was quite slack. I seem to recall dropping the bike twice more before I finally came to the faint track I’d seen from on top of the dune. Finally, a track that clearly went somewhere – once I’d managed to stay upright that is! The surface was still very soft sand, and I had to work hard to stay upright, but at least it was going somewhere. Eventually it joined up with a proper track and I was away. Was I ever pleased to be out of that! The terrain became more solid and was getting hilly, with the track twisting and winding its way among and across them. It was challenging but enjoyable technical riding and I was having great fun now, my travails among the dunes pretty much forgotten. Weekend away? They looked to be setting things up for a party. 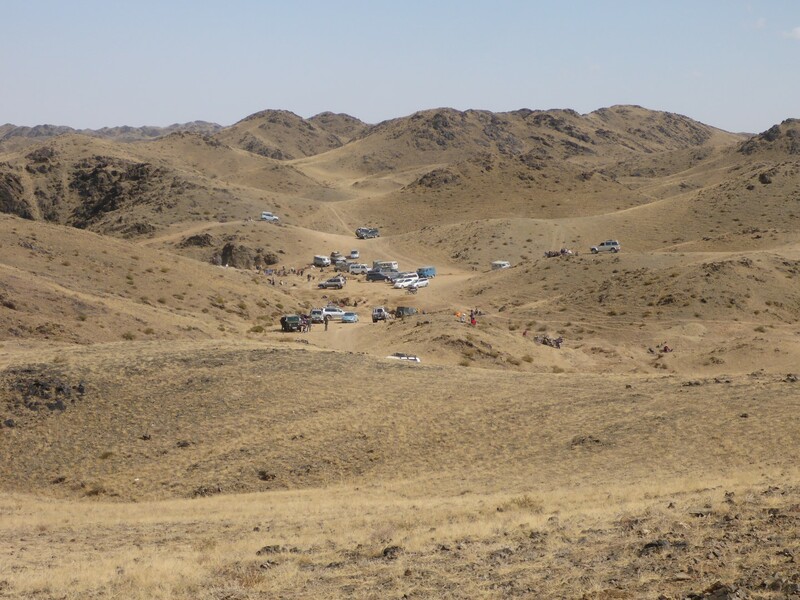 At one point I came the crest of a hill and saw a whole crowd of Mongolians and their vehicles in the valley below me. They were having a meeting of some kind, or so it seemed from their activities but I’ll never really know. Around the side of another hill was a smaller but younger crowd. A weekend out with the boys maybe? They certainly looked all set for having a good time. A couple of young lads came in to view, one on a horse, the other on a bike. I tried to ask them about the route ahead but they didn’t seem to understand. They asked me if I had anything to drink but I had to disappoint them on that score. The lad’s colourful Deel made a good photo at least. Happy young guy, living his herder life. 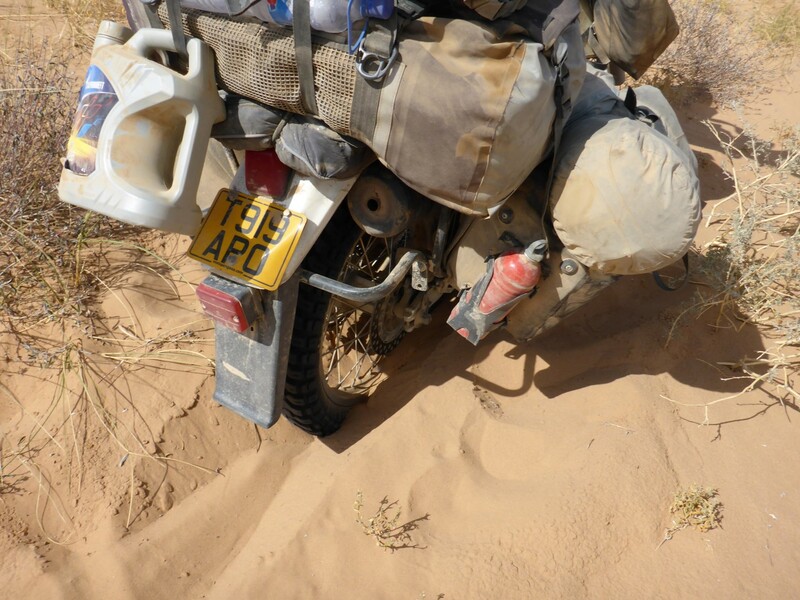 The terrain became more difficult, with some sandy, dry river crossings to struggle across again. Eventually a herder’s winter shelter came in to view and the track looked to stop there. I was annoyed at this because it was heading where I needed to go but rather than turn back I carried on and was rewarded by finding that it actually carried on past the shelter. Just as well as there wasn’t really another route. I met another herder on a bike and he confirmed I was on the road I needed and that Guichin-Us, my next destination, was about 100kms away. That agreed with what my GPS said so I was very happy to hear that. Pretty soon I found a flat and relatively stone free area in which to camp. 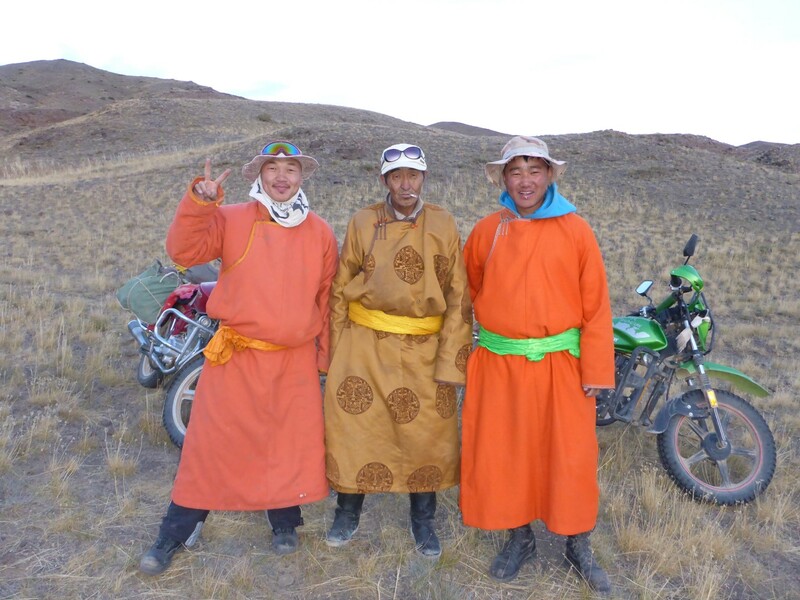 I was just brewing up when three herders arrived on two bikes and stopped for a chat. I’m pretty sure they were inviting me to stay with them but I declined as I’d already put my tent up and settled in for the night. It had been a long, tough day, with not as much distance covered as I would have liked. But ultimately I felt I’d achieved quite a lot, having had to wrestle my way out of some tricky situations over the last couple of days, albeit sometimes self inflicted. The three friendly locals who called in to say ‘Hello’. Three more local residents They didn’t bother stopping though. I was a bit chilly during the night and had to put on my winter woollies. 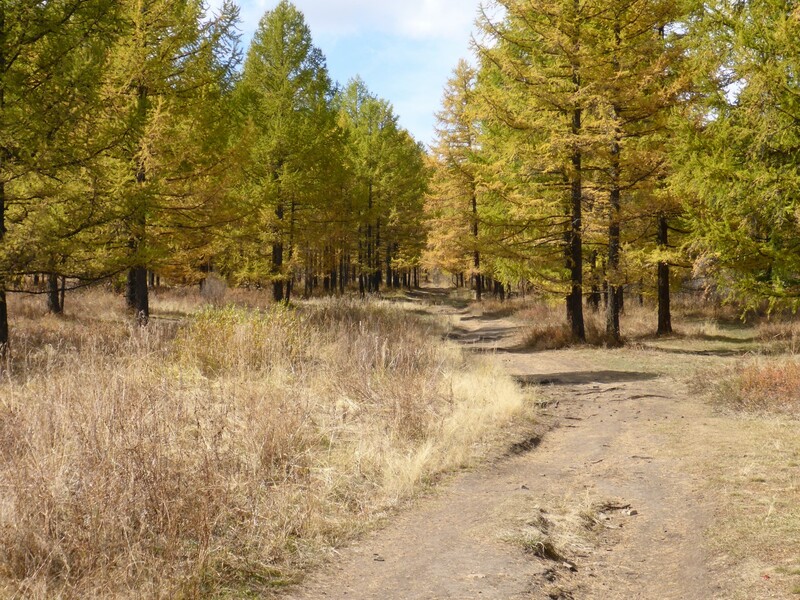 September in Mongolia definitely presages Autumn although the days were warm enough. I kept on the track from the previous day and eventually came to a T junction. Left or right? I chose right which took me past a Ger. I stopped and the herder seemed pleased to see me. He wanted to ride my bike. “No.” He wanted me to give him the clock off the bike. “No” again. He told me the track went to Guichin-Us although I had my doubts. Pretty soon it ended at a 2ft drop into a river bed with the compass saying it wasn’t where I needed to be. So I turned around and went the other way. This time the track dropped down in to a dried up river bed for a couple of kilometres and eventually disappeared. The compass said it was the right direction so I kept with it. 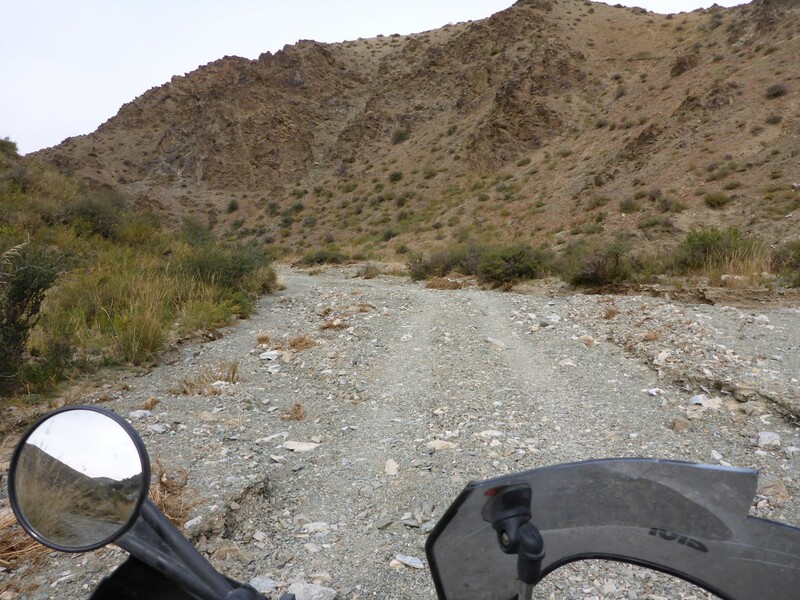 It was stony and dusty but OK until it took a sharp bend around a hill, definitely the wrong way now. So I climbed back up onto open ground and followed the compass heading until I found another track going roughly the right way. 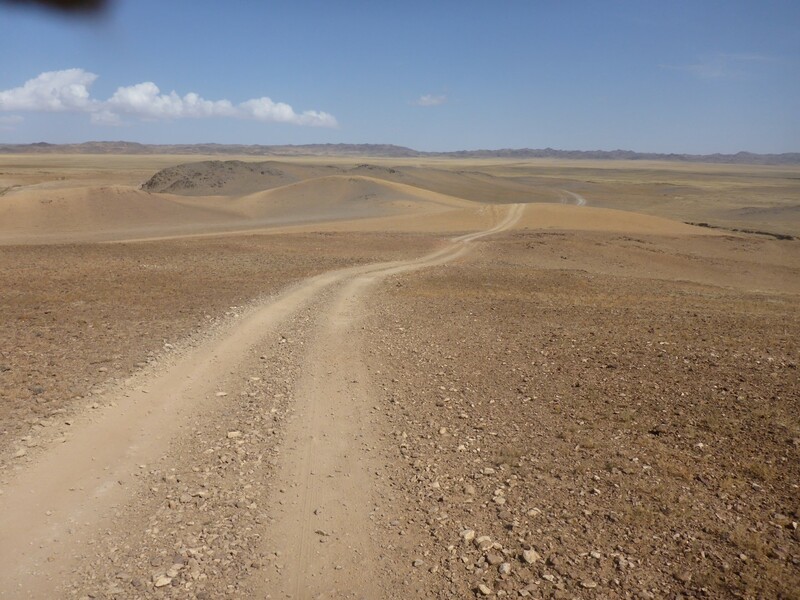 This was becoming a familiar story now and I had learnt that Mongolia would let you get to where you wanted to be if you just trusted your instincts and your compass. Oh yes, and kept out of the deep sand! More river bed riding, but at least it was in the right direction. 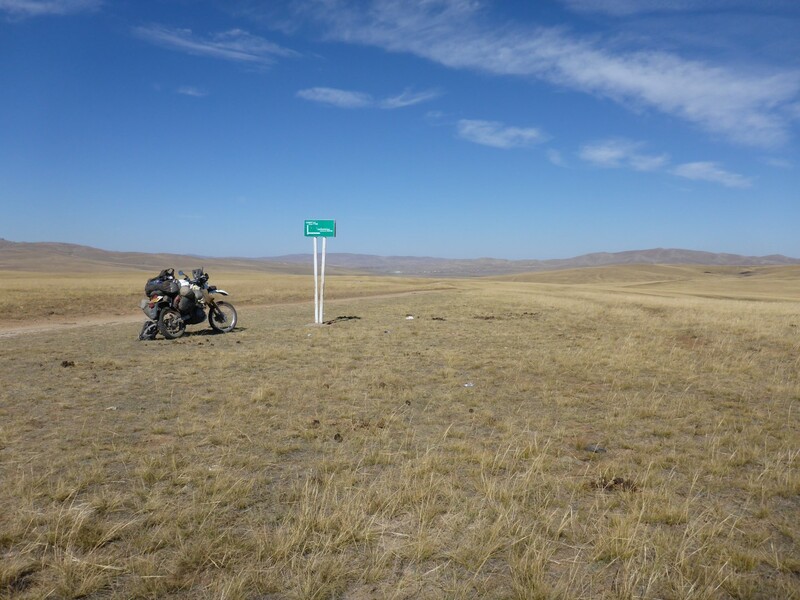 With about 60kms still to go I joined an obviously main track, a motorway in Mongolian terms, and opened the throttle with a feeling of joy at being able to hammer out some distance for a while. At one point the track crossed what seemed to be a dried up lake bed which had a muddy, salty look to it. Mongolia, and particularly the Gobi, has many such places. I often wondered how the herders managed to keep their stock watered but it seems that what little rain or snowfall there is manages to get stored underground and is available if you know where to look. By now I’d put my all extra fuel in the tank so was sweating a bit as whether Guichin-Us would have petrol. I needn’t have worried. Before long I was filled up and sitting in a café enjoying some soup and Goulash. That morning my GPS had told me the town was 100kms away. On the ground I covered 136kms. The GPS distance is pure line of sight so it was interesting to see the difference between theory and reality. The ups and downs, twists and turns, take their toll. Somewhere in the distance is a bed, hot food and a shower. Somewhere. It was about 100kms to Arvayheer, where I planned to go back to the same hotel I’d stayed in before. The weather was getting colder and the early promise of a warm day had disappeared at the same times as the clouds had rolled in. I confidently took the track out of town that I felt was the one I needed. Not quite the right direction at first, it soon justified my confidence by veering round and speeding up. I gunned the bike up into top gear and was enjoying the ride. That was until I dumped it again. This time I don’t understand how. I came over the crest of a hill and down I went. I’d slowed down, the bend wasn’t too sharp and the surface wasn’t too loose. But I still went down. And there was no soft sand to fall on this time. No damage to the bike and a small graze on my hand didn’t really count as a disaster in my mind, so I carried on. A bit slower now, but still getting up into top gear. Just after 6pm I arrived in Arvayheer. I can safely say I had never been more pleased to see a collection of rooftops. One of my rewards for making it out. Back in the same hotel, with the heating on against the chill and warmed up by a nice long shower, I contemplated the last three days. I’d set myself some challenges and felt I had overcome them. I was disappointed at not getting to the big dunes and also at coming off so many times in the sand. It’s just unfortunate that top heavy luggage and loose sand simply don’t go together, at least not at my skill level. But when I did get stuck I managed to get myself out and I really enjoyed some of the challenging riding. Track Trickery was how I thought of some of the terrain I’d crossed, especially the dried up river beds and the technical climbs through the hills. I felt really good at having navigated my way across the area by compass and instinct alone and also enjoyed meeting the herders I came across. What they must have thought of me I have no way of knowing and couldn’t begin to guess. Doris handled it all well for the most part and doesn’t seem to have suffered any adverse effects. The only thing I noticed, as I was unloading the luggage, was that the rack on the back had a crack in one side of it. A small welding job was required, something to try to get done next day. So I deemed my mini adventure to have been a success and felt good about all aspects of it. 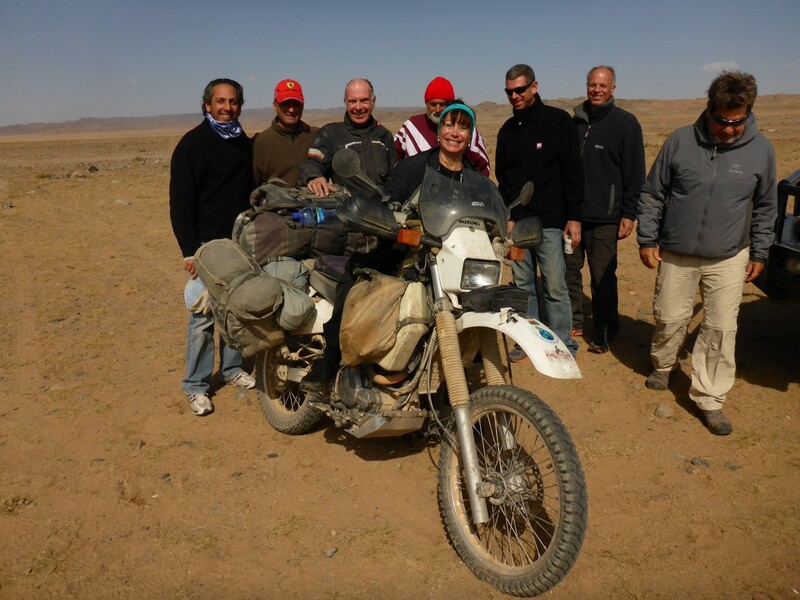 Mongolia was becoming good fun and we seemed to get on well together. A day in Arvayheer was spent loafing around, catching up on some writing and some shopping. The weather was wet and cold so I was very pleased not to be riding. I bumped into a Belgian couple who’d flown their bicycles into Ulaanbataar and would be riding some of the same roads I had. They had three month visas for China too, something that I yearned to achieve. One of the advantages of two wheels but no engine. The plan for next day was to head to Khakhorim, the town that was now near the site of Mongolia’s ancient capital of Karakorum. I researched accommodation and found a place called Family Ger Camp, which sounded interesting. My bike had been put in one of the garages around the back and I had a frustrating time trying to get it out when I came to leave. The woman at reception was busy preening herself when I asked her about the key for the garage. I’m not sure what she thought I had asked her but her response was to come out from behind the desk and stand in front of a full length mirror and preen herself even harder! I got there in the end and, once loaded, I set off. I took the main road towards the capital but then turned off across country to wards a town called Khurjirt. The track was easy riding and wound through the hills,eventually bringing me to the top of a hill that overlooked the town. Drink and snack stop. Can you spot my bag? 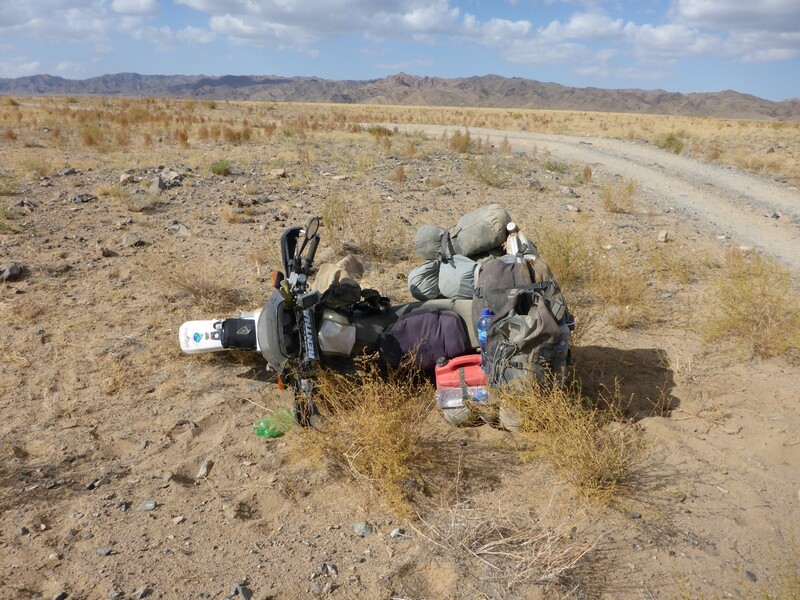 I stopped for a quick drink and a snack before wending my down to Khurjirt, then along the edge of the town to where I picked up a nice asphalt road that took me to Khakhorim. On the edge of town was the Erdene Zuu Monastery so I pulled up outside to have a look. I instantly realised that my rucksack was no longer on my back. I’d put it on the ground when I stopped for a snack at the top of the hill and ridden off without it. I was livid! The bag contained some important items but most valuable and completely irreplaceable was my journal. I got straight back on the bike, stopped for some fuel then hammered poor Doris all the way back to Khujirt as fast as I dared. Once I got back there I did my best to select the right route back out of it. There were several tracks leading back up the hill and I needed to choose the right one. Fortunately there was a rocky outcrop on the top of it and the track I’d come down on wasn’t too hard to spot as it happened to bend around in a recognisable way. It was all very well finding the right route back up there but would my bag still be there, two hours after I’d left it behind? Well I’m delighted to say that it was exactly where I’d put it down. It’s hard to describe my relief and the extra 120kms riding turned out to be well worth it in the end. Here it is again, exactly where I’d left it. Phew!! Back at Khakhorin I went to see the monastery again and enjoyed walking round the grounds and looking at the statues and decorations in the temples. Mongolia is a Buddhist country and, as already mentioned, suffered from the Soviet inspired attempts to eradicate the religion. 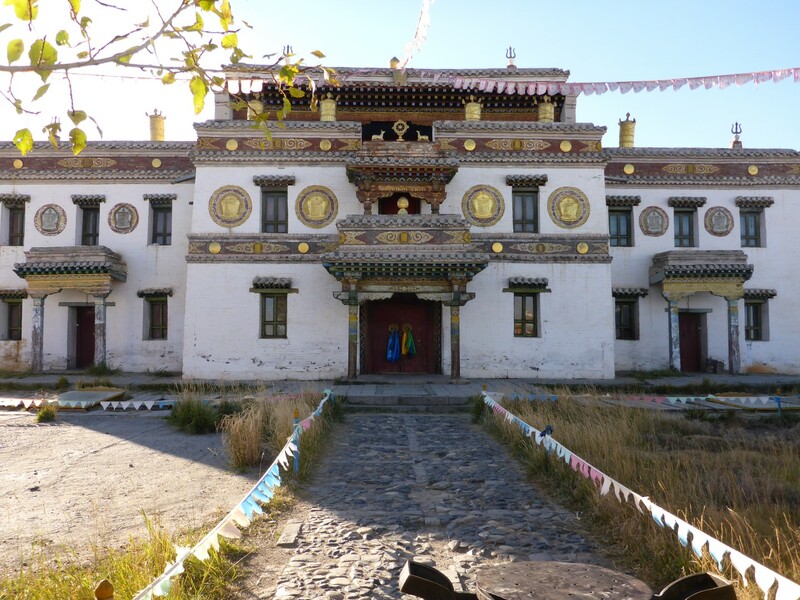 It is one of Mongolia’s earliest surviving monasteries and was built around 1585 using the stones from the now deserted capital of Karakorum. Although it had a difficult history over the centuries its worst time was when it was ordered to be destroyed by the Communist Regime in 1939 as part of a purge. It was partly destroyed but the ancient walls, and the 108 Stupas that were part of it, remained along with some of the temples inside. Stalin ordered the destruction to stop because he wanted foreign dignitaries to be able to visit it as part of his attempts to convince the world he was tolerant of religions. After the war the buildings became museums. Post communism, the complex was handed back to the monks and is now a functioning monastery once more. Some of the buildings are beautiful and are fine examples of this kind of architecture. I was fascinated by many of the statues and figures inside them. Large Buddhist statue but not sure who it is. I found Family Ger Camp easily enough and was shown to a Ger with four beds and a small stove inside it. I was sharing with a young French guy named Théo. The Ger had electricity in it and there was wi-fi available, albeit intermittent. The owner and his wife, Ganbataar and Suvol, had westernised the facilities as much as they could. There was a flush toilet – very rare in a small town like this – and a shower. They lit the stove in the evening and although it made the Ger warm it also filled it with smoke. A very mixed blessing. The price included breakfast and dinner so at least I didn’t need to worry too much about where to eat. There was an American staying in another Ger, name of Andy, who came from Seattle. 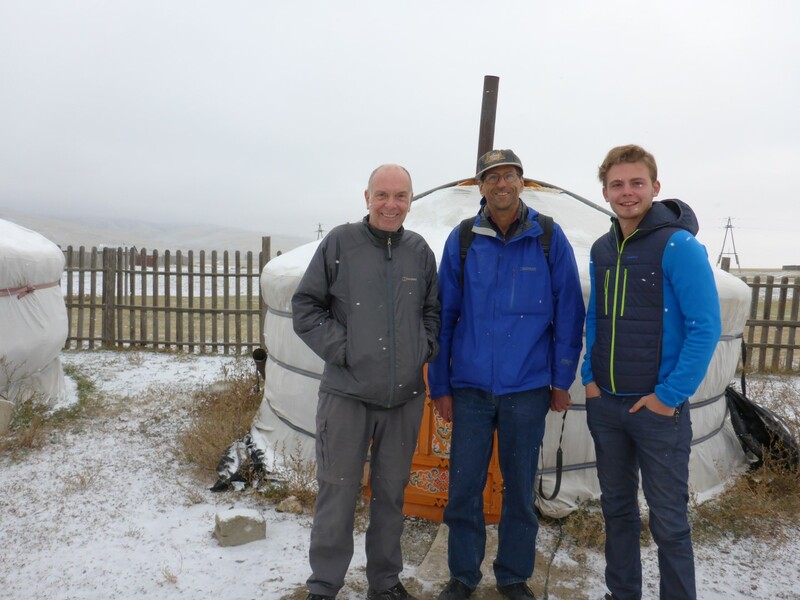 He loved Central Asia as a place to visit although it was his first time in Mongolia. He and Théo had decided to hire a car and driver to visit a temple complex that was up in the nearby hills and I decided to join them. 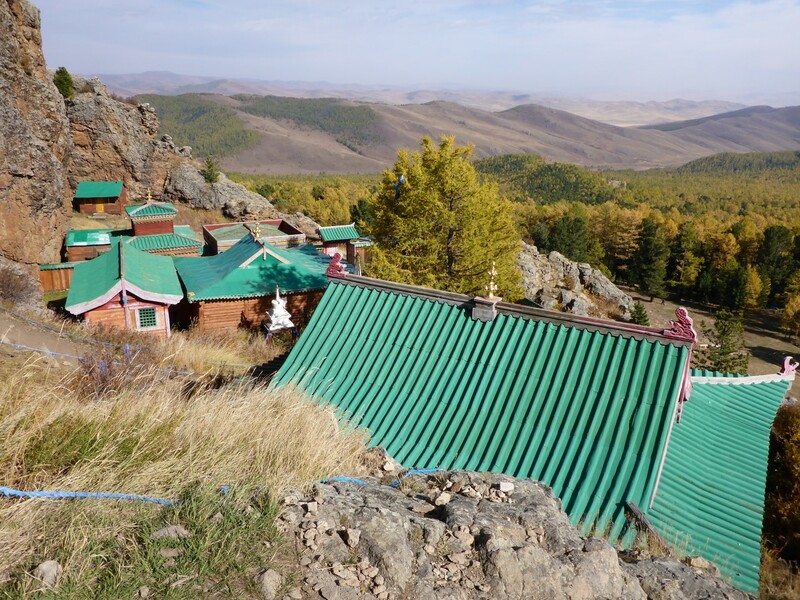 Tovkhon Monastery was built on top of a mountain at 2600 metres in 1648. It was destroyed in a battle forty years later but was rebuilt. It was destroyed again in the Stalinist purges and was finally restored in 1997. It is a working monastery and its attraction for us lay in its location. It was a three hour drive across some fascinating terrain to get there. This was followed by a 45 minute walk up a very steep, wooded slope. This it itself was unusual as I hadn’t seen too many trees since entering the country. The start of the steep path up to the temple. Woods like these had been very scarce up to now. 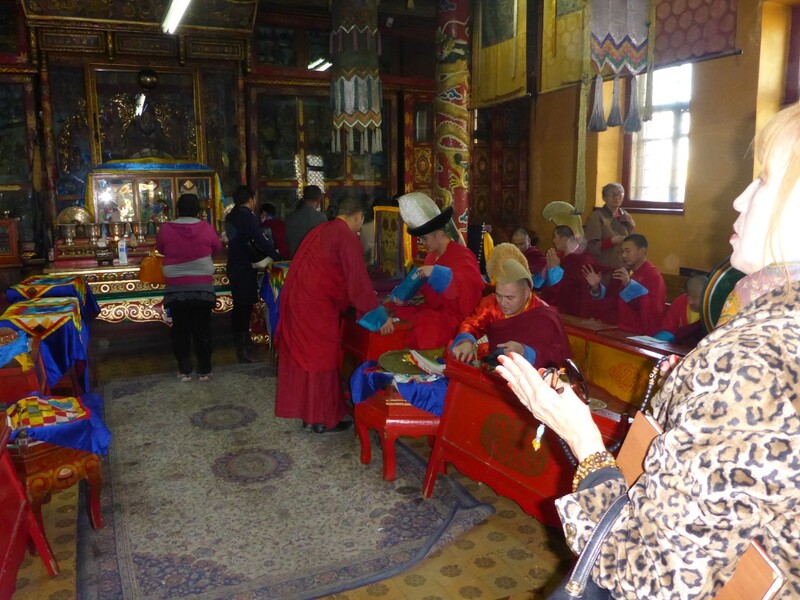 Most of the buildings were quite small although typically Mongolian Buddhist in their style and decoration. None of them were open so we couldn’t see what was inside them and there was no-one around to show us. What was good though was being able to climb up on the rocky hilltop above the buildings and enjoy the fantastic view over the surrounding countryside. In years gone by some monks had become hermits and lived in caves above the complex. There were also a couple of holy routes up the hillside involving a bit of precarious climbing. We enjoyed the challenge though and had an enjoyable couple of hours up there soaking up the spiritual atmosphere. From my point of view, above all else, it was great to be in the company of intelligent and intelligible people with whom I could enjoy some decent conversation. Excellent view from the top of the temple hill. The temple buildings are below us. Andy joined us in our Ger for the evening but he was due to take the bus back to the capital next day. Shame. When we got up there was snow on the ground and all the water and sewage pipes had frozen. So much for modernity. We were back to doing it the old fashioned way. It was bitterly cold and I made use of all my warm riding gear to keep warm when we ventured out. Théo and I saw Andy off and then decided to walk down to the museum which told the story of the area. 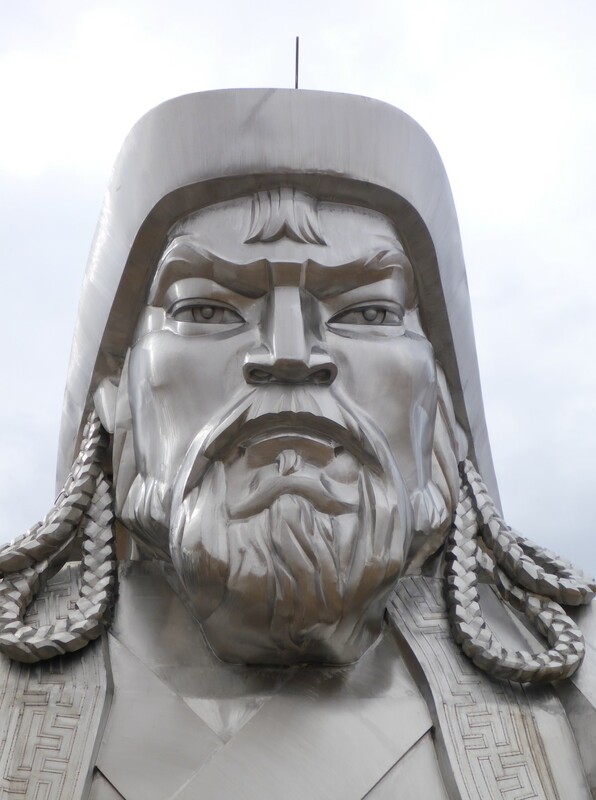 It covered pre history as well as the Mongol period and gave a fascinating insight how Chinggis Khan rose to power and how his sons and grandsons held his empire and extended it. 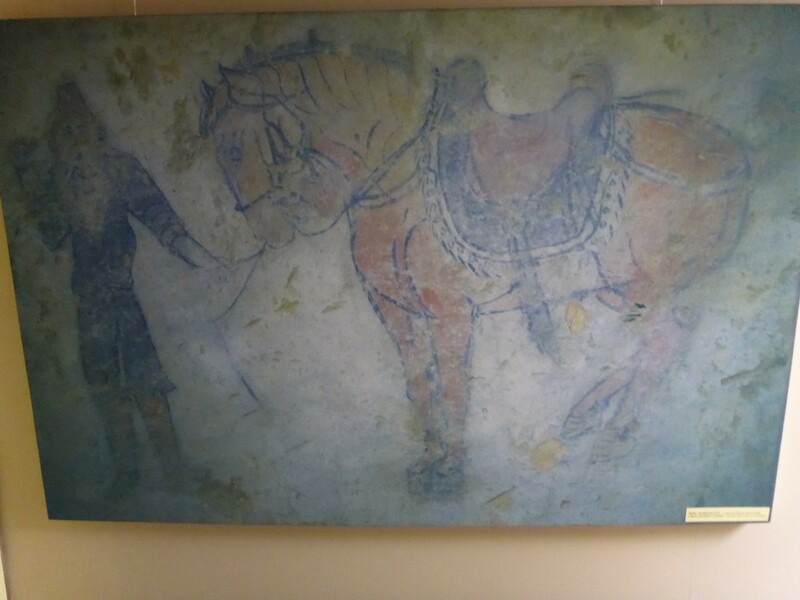 A copy of one of the ancient cave drawings. There were examples of ancient standing stones as well as copies of cave paintings that had been discovered in the hills nearby. 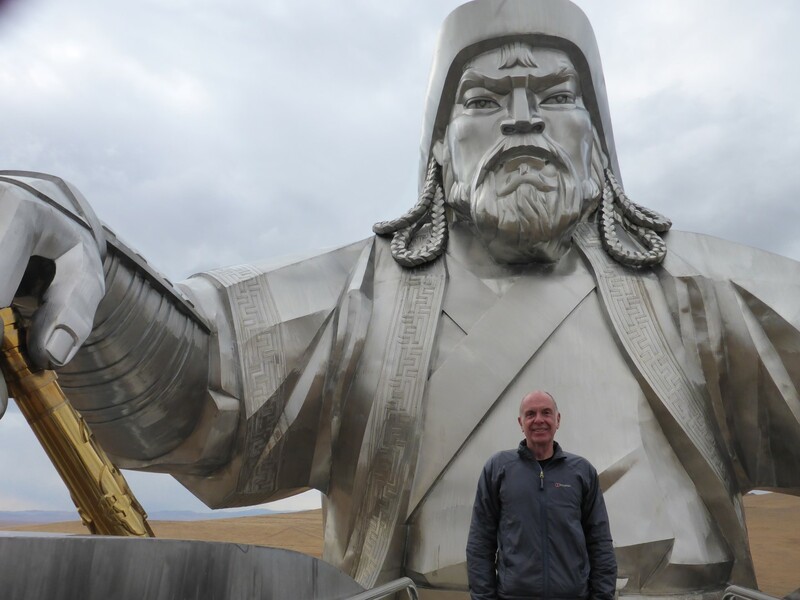 It was here that I learned about how the Mongol Empire had begun and how it had grown to become the largest land based empire known to the world. There were some informative diagrams and copies of contemporary paintings of the people involved. An excellent museum in fact, and well worth the time spent in there. And it was warm inside! 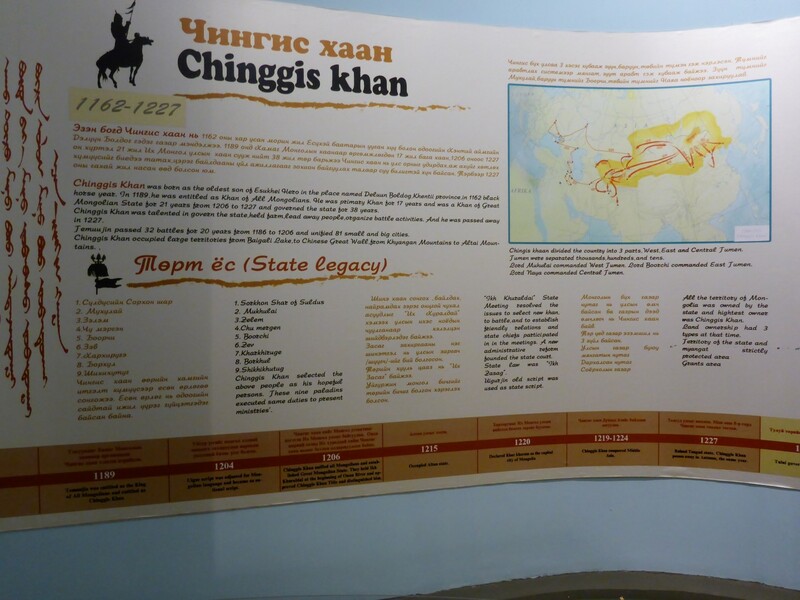 All about Chinggis Khan, the Main Man. 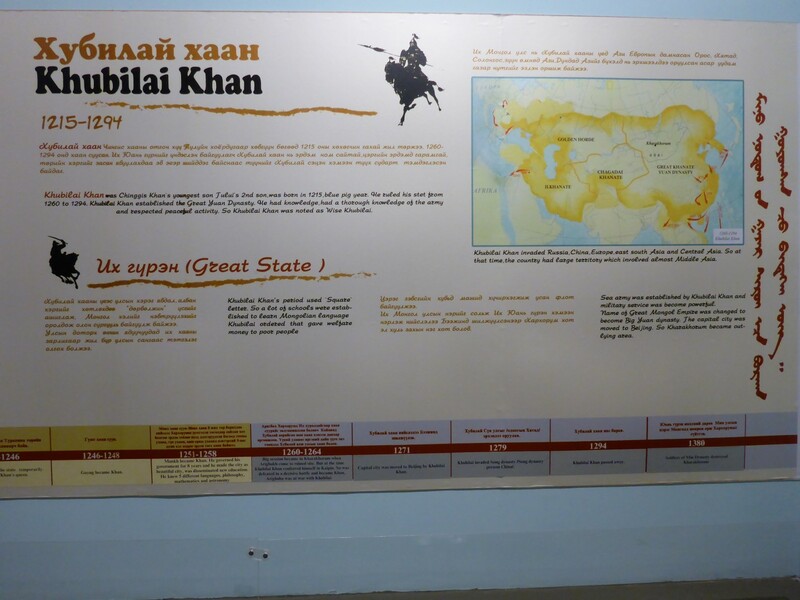 All about Khubilai Khan, his grandson. The maps show the size of the empire under each leader. Théo wanted to see the monastery so we walked down there but stopped for a coffee in one of the cafés opposite. We bumped into a French couple inside and Théo discovered they were planning a horse trek down to one of the nearby national parks. He was keen to go with them and they agreed to meet the next day to make arrangements. I was pleased for him. He had taken a year off work and was only two weeks into his journey and already it was shaping up into an interesting time for him. Unfortunately the buildings in the monastery complex were closed as it was Sunday but we wandered around the grounds and Théo declared himself satisfied with that. We knew from the museum exhibits that the ancient capital had been sited next to where the monastery now stands so we took a walk around the area, just to get the feel of it. There’s nothing to be seen now but we could at least get some idea of the scale of it. The area it had covered was large and it would have been an impressive place to the many visitors from around the world who came there. There was a model of it in the museum and of particular interest was that there were churches from all the main religions in the city. Chinggis was keen to promote pluralism within his empire. 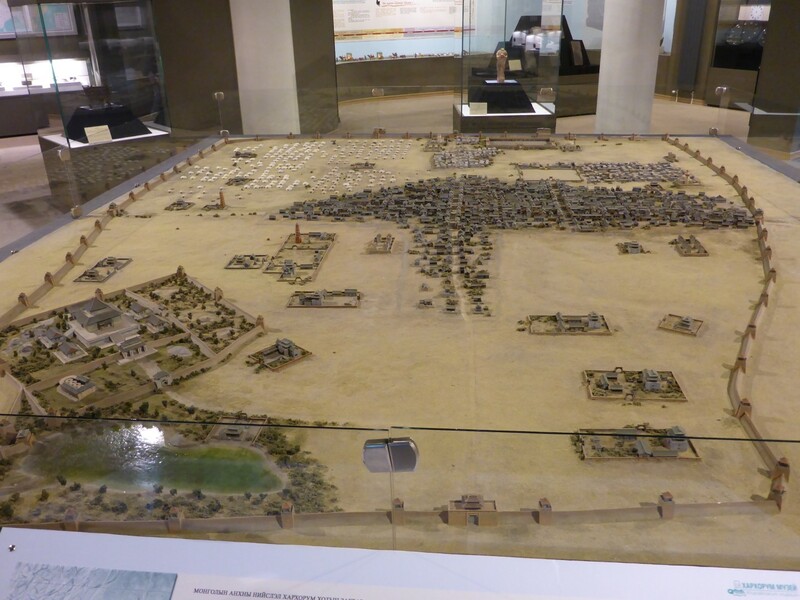 A model of Karakorum, the ancient Mongolian capital. We bumped into a man and woman who we’d seen around the Ger camp. They were David Wilson and his assistant Eva. He is curator of the Museum of Jurassic technology in Culver City, California. He had been studying the monastery as part of one of his projects. He gave me his card and said to make sure I came to visit him when I got to America. It sounds like a very interesting place so I’ll be happy to visit him there when I can. Back at the camp I asked Ganbataar if he had a drill. I’d decided to tackle the repairing of my screen. Given how cold it was outside I did not fancy riding anywhere else without it. My plan was to superglue it together, support that with gaffer tape and then tie the parts together with small cable ties. For that I needed to be able to make some holes. He came back later with a drill but no bits. In the end we managed to drill the holes with a nail. Technically, a mess. Practically, a perfect result. I set to glueing the pieces together. They didn’t stick too well at first but I left them over night to dry and in the morning they were solid. Whether it was exacerbated by the glue fumes I don’t know, but I suddenly found myself really suffering from the effects of the smoke that tended to escape into the Ger. The fire was essential for warmth but seemed to be slowly killing me! The snow had cleared up although it was still very cold. I headed up to the container market in town as a I needed a few things. This was one of the biggest and most varied I’d seen on my travels. 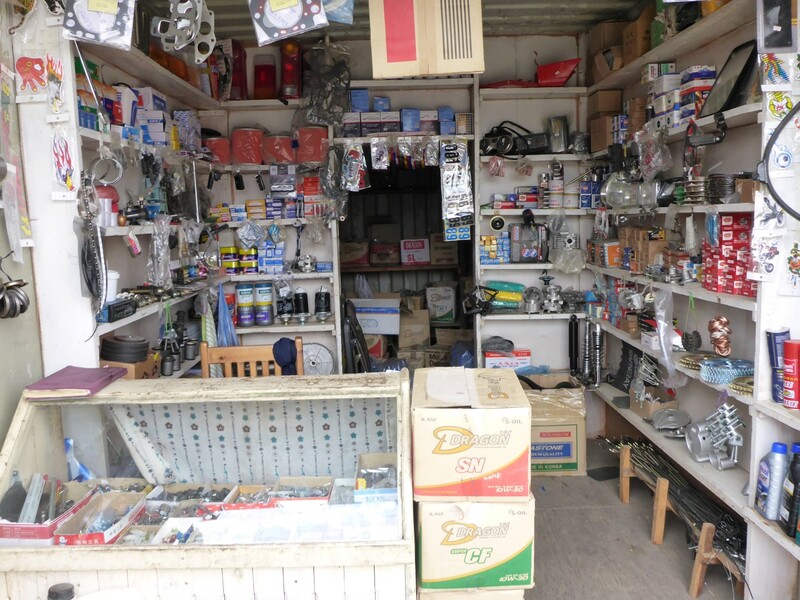 Pretty much everything was available there and although some of the containers focused on particular types of goods – car and motorcycle parts for example. Many of them sold every type of dry goods you could think of. My luggage rack had now broken on the other side and I planned to get a couple of worm drive clips to put around the cracks in an attempt to strengthen them. I also needed a new mug for when I was camping as my other one had broken. I could still use it but it was difficult. Théo had a metal mug with a lid on it which doubled as a kind of brewpot. It looked like just what I needed. Anything and everything sold at the container market. A container display of car and bike spares, including worm drive clips. I bumped into Théo, Bori and Anais while they were food shopping for their four day trek. It was costing them EU80 each, which included accommodation but not food. They were also trying to buy a small stove. After a while I’d managed to get all the things I needed, including a smaller version of the metal cup that Théo had, so I went back to the Ger to complete the repairs on my screen. It all went well and I soon had it stitched back together with cable ties and mounted back on the bike. It looked a mess but was going to do its job. Screen repaired and back on the bike. When we initially arrived at the camp we were being called into the family Ger for our food. Over the last couple of days they’d brought the meals to us in our Ger. Suvol was about five months pregnant and I think she was suffering a bit at that time. They already had three children, a teenage boy and two younger girls. 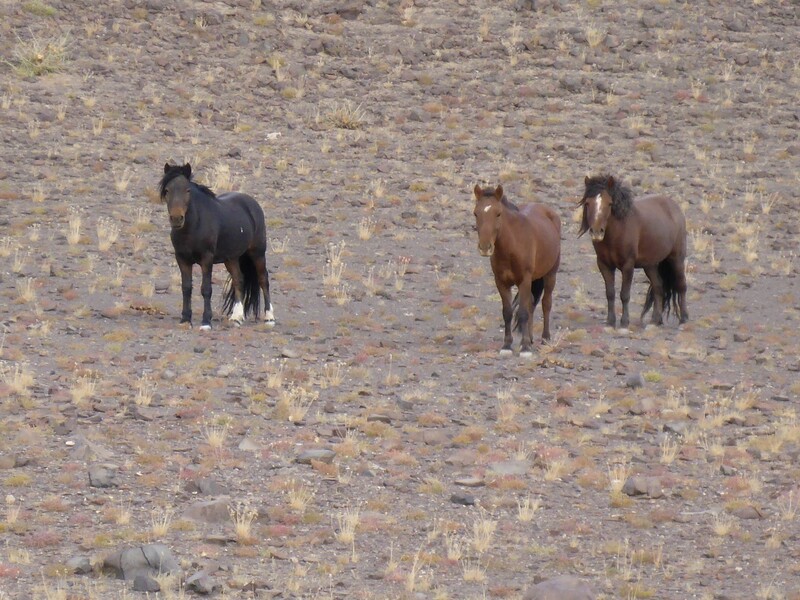 They struck me as being a bit more go ahead than many of the Mongolians I’d observed up to now. They had big plans for their tourist camp, including sports facilities. They certainly had a positive approach to their guests, doing everything possible to make us comfortable and warm, despite the weather.I thought it was a great place to stay although I think I’d only be recommending it as a summer residence! Ganbataar, Suvol and their youngest daughter. Modern Mongolians. Leaving for Ulaanbataar I was conscious that it was slightly warmer than it had been the last few days but ‘slightly’ is the key word here. In reality it felt bloody freezing and I was very glad that I’d managed to repair my screen and was very grateful to Ganbataar for his help. The road was reckoned to be good but I had been told there were roadwork related diversions every so often. And there were, some of them over 2kms long. They tended to be rough, usually sandy, but at least the effort required to stay upright kept me warm. When I stopped for a break it took me a while to feel my feet again. I even welcomed the crap 3-1 coffee that I was forced to drink, in the absence of any other kind. At least it was hot. Ulaanbataar eventually hove into view through a heavy smog. There were some kind of digging or quarrying works taking place just outside the city. Couple the dust from those with the fossil fuel smog that hung over it as well and I knew I was going to be in for some heavy breathing, but none of the pleasure that can sometimes go with it. Part of the problem is that the city sits in a valley and doesn’t have the strong breezes that many other areas do so the smog can’t clear so easily. But on the other hand, 1.1 million people definitely created plenty of pollution. 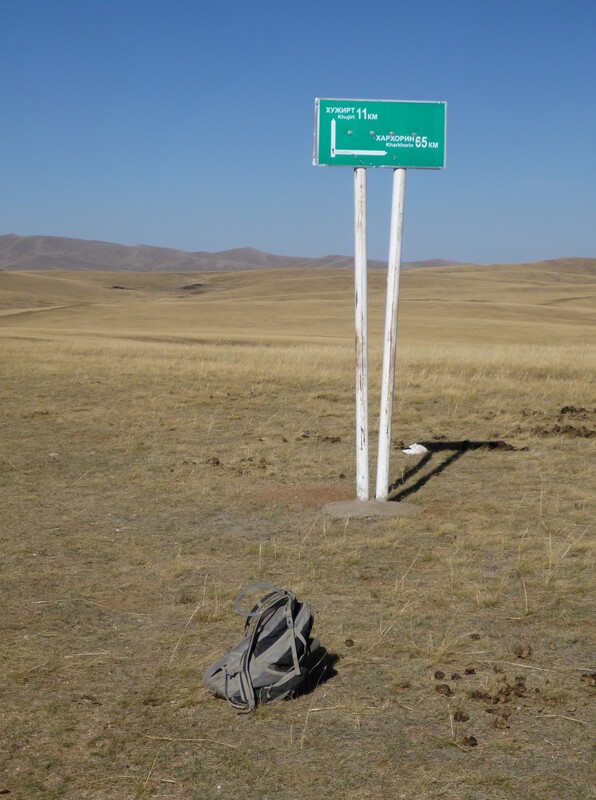 I had some approximate coordinates for Mongolia Vision, the hostel I was heading for, but they weren’t accurate enough to get me right there. My latest navigation method had been to go on Google Maps and Google Earth, locate the place I wanted and then take photos of the computer screen as well as putting the coordinates into my GPS. That gave me an image to look at on my camera, which has a zoom facility when viewing pictures.. Unfortunately I didn’t have an exact idea of where I was because on the ground the street names either couldn’t be seen or couldn’t be understood. The GPS had got me close so operating on the principle that a teenager always has the answer to a technical problem I stopped a young lad who spoke enough English to understand what I wanted. He was able to use his phone to show me where I needed to be. I wasn’t far away and soon found the hostel once I’d recognised some of the landmarks from Google earth. Mongolia Vision Hostel is a nice place, staffed entirely by women. I’ll come back to that later. They also arrange tours out to the various sights and sites, short or long depending on what the tourists concerned wanted. It was located just off Peace Avenue, which is the nicely named main street through the city. As well as the fairly common free tea and coffee, the price also included breakfast. That’s always a nice bonus as it sets the day up right. My room mate is a young South Korean guy who is trying to set himself up in an import/export business. He speaks Mongolian, Chinese and Japanese. Clever lad. It’s good to see people getting out there and using their skills. There weren’t a huge number of things to see in the city – a large monastery, some statues and buildings and some shops. 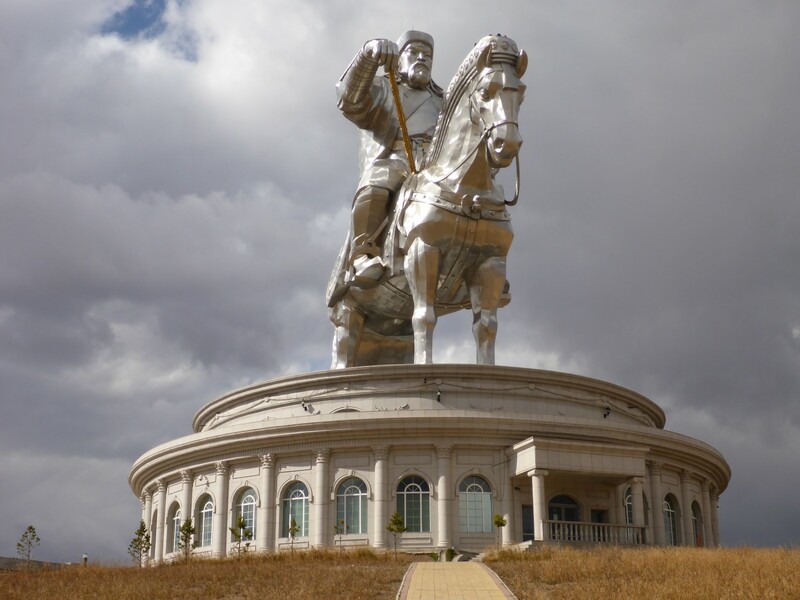 Outside of the city is a huge statue dedicated to Chinghis Khan. I’d heard about it and definitely wanted to see it. 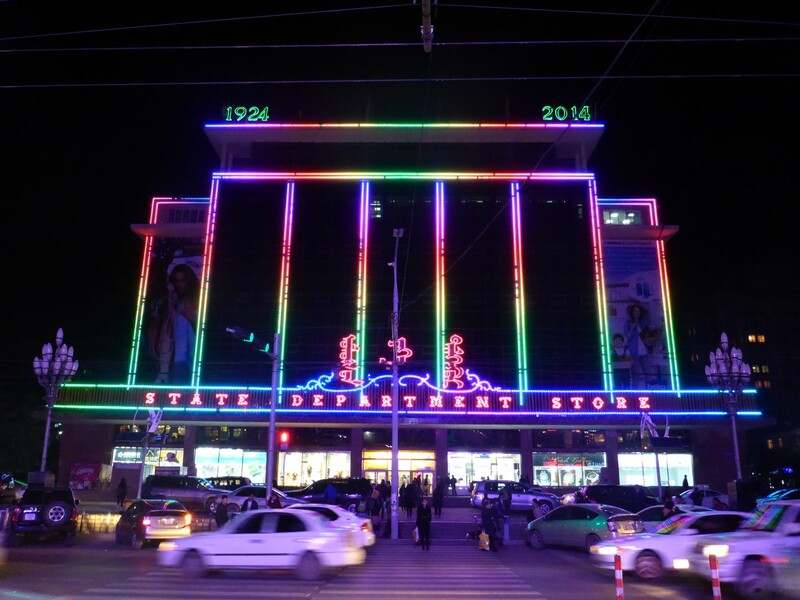 In keeping with Mongolia’s former status as a communist state, the city had a State Department Store. 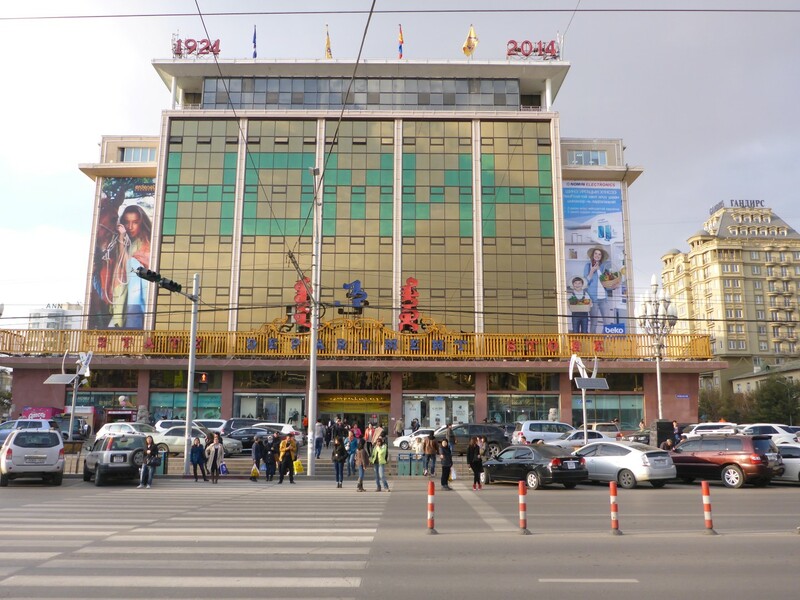 I don’t know how it used to look back then, but it is now a huge, seven floor edifice with everything in it in a classic department store style. I spent quite a while wandering around it and earmarked a couple of things I wanted to buy once I’d had a chance to look around the rest of the city. It fooled me into thinking things were far cheaper than they actually were, but all the labels have a discount price which applies if you buy more than one of the item. I was quite impressed with some of the prices until I realised this. Even so, I bought some things I needed once I’d checked that I couldn’t get them cheaper anywhere else. It was a fascinating experience. They used some o the methods found in Russian shops, where you selected what you wanted, went to a cashier to pay for it, then went back to get your goods. The State Department Store by day. There was a huge supermarket on the ground floor, expensive leather and cashmere clothes on the first floor, washing machines and fridges above that and so on. One thing that I thought was very clever was how the escalators moved very slowly untilstepped on them at which point they sped up. Very efficient. I enjoyed a coffee and a cinnamon cake (delicious!) in the café on the seventh floor and was fascinated by the behaviour of the teenage school kids I saw there. They were all very fashionably dressed, chewing gum, chatting and texting on their mobiles. They were generally behaving just like teenagers anywhere. Why was this so odd? Because it was the only place in Mongolia where I’d seen such behaviour. All the other towns I’d been in had youngsters that looked not much different to the adults and were often working along side them. It just struck me as strange. 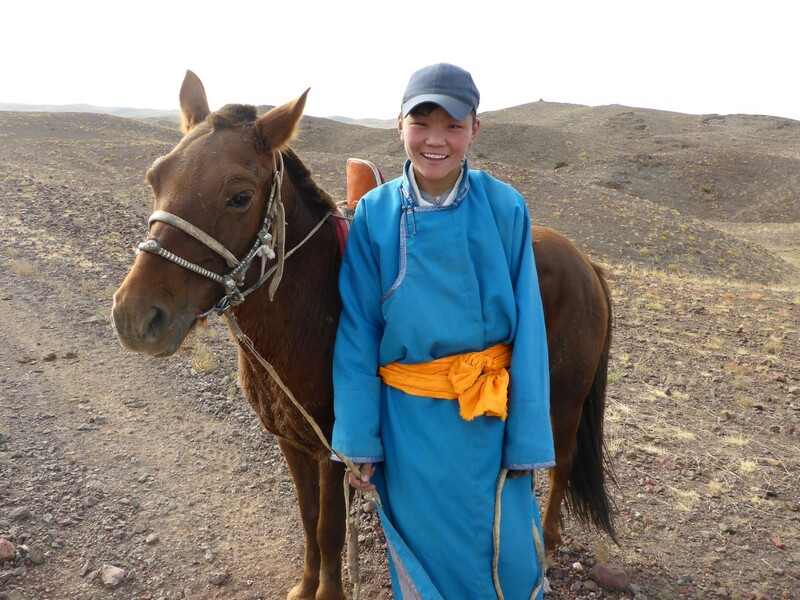 I was observing a group of girls chatting away and was wondering what the young lad on the horse that I’d spoken to, dressed in his Deel on the fringes of the Gobi Desert, would have found in common with them. Worlds apart I suspected. 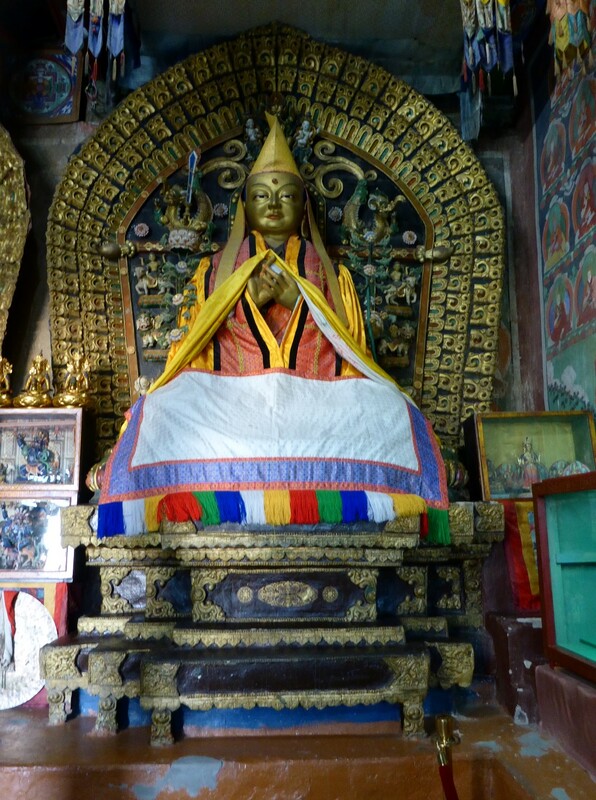 Down one end of Peace Avenue can be found Gandantegchinlen Khiid,a Tibetan style monastery that was opened in 1809. Over the next 100 years a variety of extra temples were added, dedicated to various Buddhist figures. 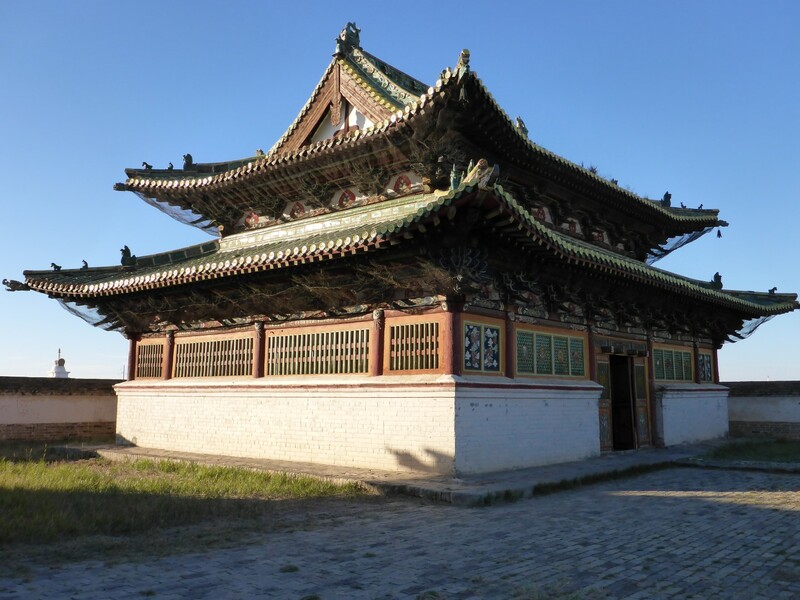 It was almost destroyed under the Communist regime but was allowed to remain, one of the few allowed to do so, as a reminder of the Mongolian culture and religion. It is now a very active place, with over 1500 monks busily doing whatever it is that monks do. One of the temples contains a 26.5-metre-high statue of Migjid Janraisig, a Buddhist bodhisattva. Confined in such a relatively small space, it looks absolutely huge and surrounded by decorative drapes and figures. No photos allowed of that one unfortunately. 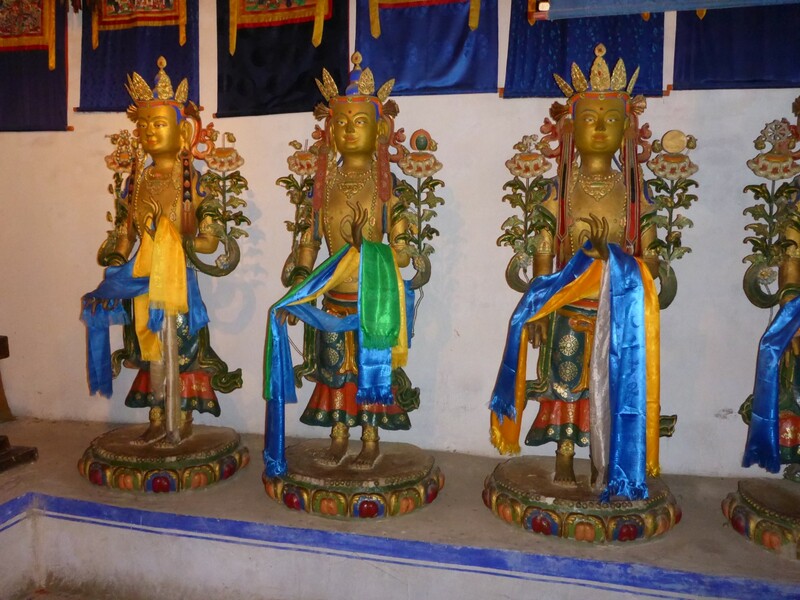 The buildings are very ornate and there are various Buddhists artefacts around the grounds. I was able to take a look inside one of the temples just as a service was finishing. I naughtily sneaked a photo. I was interested to see all the various robes and headdresses that the officials wore. I had always thought of Buddhism as being quite an understated religion, focused on the message rather than the fripperies, but it seems not to be the case. Given the simple messages at the heart of the philosophy I felt rather disappointed to see all the fancy clothes and rigmarole. But I suppose, like most religions, Buddhism has more than one way of skinning its particular cat and I suppose people like to have ownership of it too. Robes and hats, the paraphernalia of worship. Talking of cats, any that wandered inside the temple complex would have had a field day. 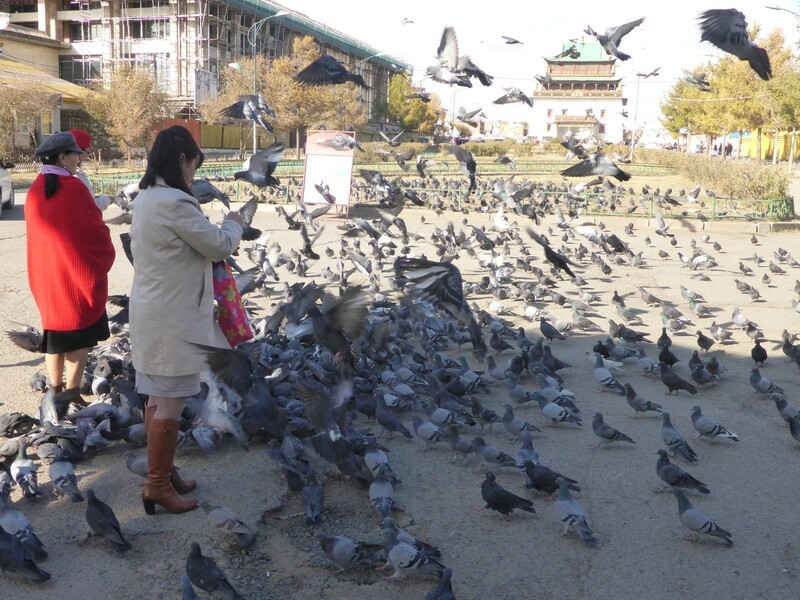 There were pigeons there by the thousand, mobbing anyone brave or foolish enough to feed them. They were like a feathered, moving carpet and I felt they were probably more of a nuisance than a delight to both occupants and visitors. Maybe a few cats were needed to be put among them. Parliament building with essential statue. 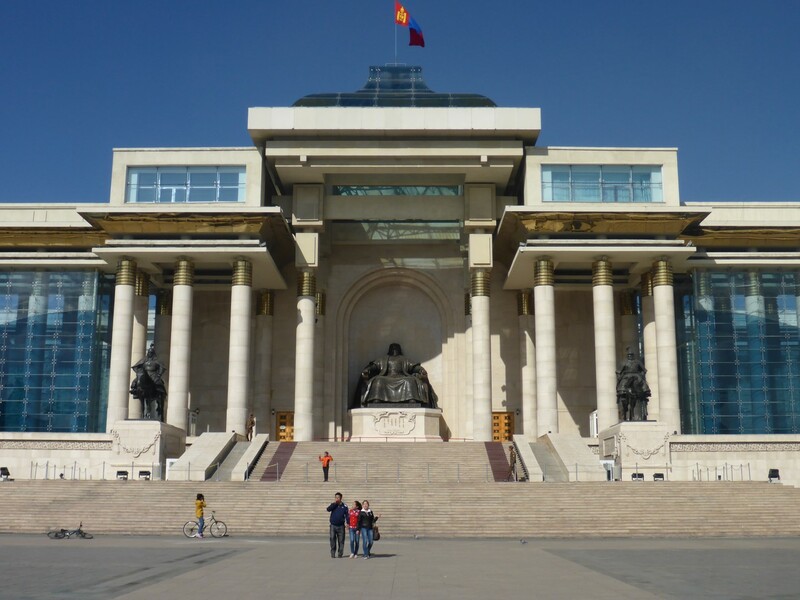 Earlier I’d taken a walk through Sukhbaatar Square which houses the Government Building. There were some nice statues outside with plenty of photographers keen to take a photo of you next to one – for a fee of course. Generally I was impressed with the city. It has plenty of skyscrapers and shopping centres, modern and gleaming, but also has pockets of charm and some nice open spaces. It was nice to see that the close human contact that typified business in the small towns was still operating here. I saw plenty of small street side stalls offering services such as while-you-wait shoe repairs. I had a nice conversation with Davka, the owner of the hostel. I told her how I’d noticed that many of the businesses in the various towns seemed to be run by women. We talked about the education system in Mongolia too. Generally it seems that it’s the girls who are keen to go to university and the boys are happy to be herders, labourers or whatever. In her opinion the men tended to drink too much and had no ambition. Her business employed thirty people and she hadn’t yet married or had kids, at thirty three. I was curious as to whether marriages tended to be arranged but she said people mostly married for love. Generalisations of course, and having observed some of the school boys in the city earlier, I couldn’t visualise any of them as hard drinking labourers, so I feel that things may be changing for the better among the next generation. I learnt that the average monthly income is around EU400 but because families will often work as a group that can be up to EU1,000 per family. Herders tend to be very wealthy. They sell much of their stock around this time of year and do very well out of it. That would explain the new pick up trucks and satellite dishes I’d often see outside the herders’ Gers. First view of the man on the horse. 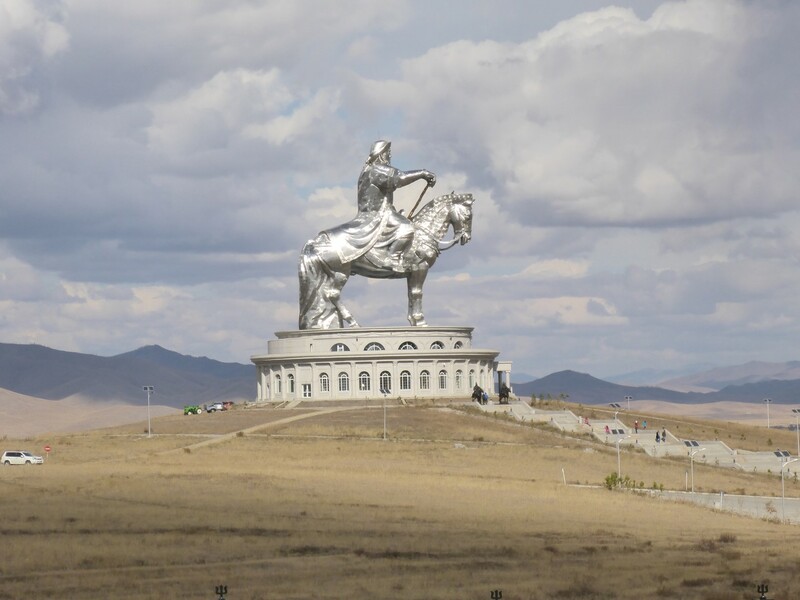 Next day I rode the 50kms out of the city to visit the giant Chinggis Khan Equestrian statue. This is nothing short of amazing! It is absolutely huge and sits on top of a museum complex, making it look even bigger. CG’s mother is no shrinking violet either! I thought the two museums were very interesting but the best part was getting in the lift and then climbing the rather low roofed stairs up to the observation platform. The view from the top was amazing and when it’s finally finished, the complex will be really stunning. The statue is made from 250 tonnes of stainless steel and glistens and gleams in the sun. It looks stunning! A few hundred metres up the road is a second complex with a big statue of his mother looking towards him, ostensibly welcoming him home. That will be open next year. The circle of Gers hasn’t been completed yet either but the sites have been marked out so I could get a feel for how it would finally look. Me and my mate Chinggis. He doesn’t look too friendly does he? Up on the top of the statue I met a German, about my age. It transpires that he is a judge and was in Ulaanbaater to give advice to the Mongolian Government.It seems that the German judiciary give advice on legal and procedural matters to the government. That’s good to hear. We enjoyed a coffee together and a nice chat. He was due to fly home next day. On the ride back I particularly noticed the amount of large 4×4’s that were in the city. It’s almost as if the city sits in a vacuum, separated from the rest of the country. About 10kms outside, pick ups reappear as do Chinese motorcycles. But once back in the urban cut and thrust, the large 4×4 is king once more (Ulaan Batterers, as I thought of them) and the pick up and bike disappear. I only saw about a dozen bikes in the city and they were all European or Harleys. The traffic was very heavy as I journeyed back and eventually I realised why. It was school run time and the streets were full of Chelsea Tractors picking up the blessed little ones. Progress for Mongolia? While in the city I’d managed to completely avoid eating any sheep based dishes, thankfully. Pizza and some Chinese noodles had done the job. But Mongolia raises a lot of beef and I really fancied a steak. Near to the hostel was an Irish Pub ( is there a city in the world that doesn’t have one?) and I’d been told the steaks were good. How wrong my informant was. Having checked that the beef was fresh and Mongolian, I ordered a fillet steak and was served two pieces of the best steak I’d ever eaten. They weren’t good, they were absolutely delicious! I was very pleased to be enjoying such a tasty last meal in Mongolia although it wasn’t cheap by local standards, it certainly was by British ones. What a great meal! 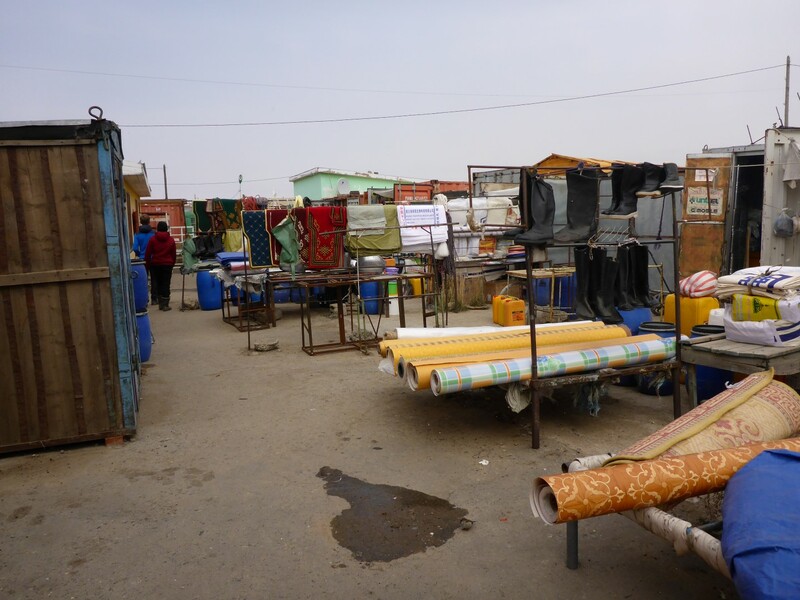 Ulaanbataar had been a fascinating place to visit. The name means Red Hero, the word ‘Red’ being used in the same way as the Russians use it, to mean ‘best’. It is certainly big and very busy. And it easily earns its place as the world’s second most polluted city. My lungs certainly thought so. Not surprisingly its more modern approach to life slowly spreads out into the country areas and I had seen the evidence of that in the towns I’d visited. The influence of the tourist industry has spread, causing more hotels to be built, but also, I believe, focussing people’s minds on their own heritage. 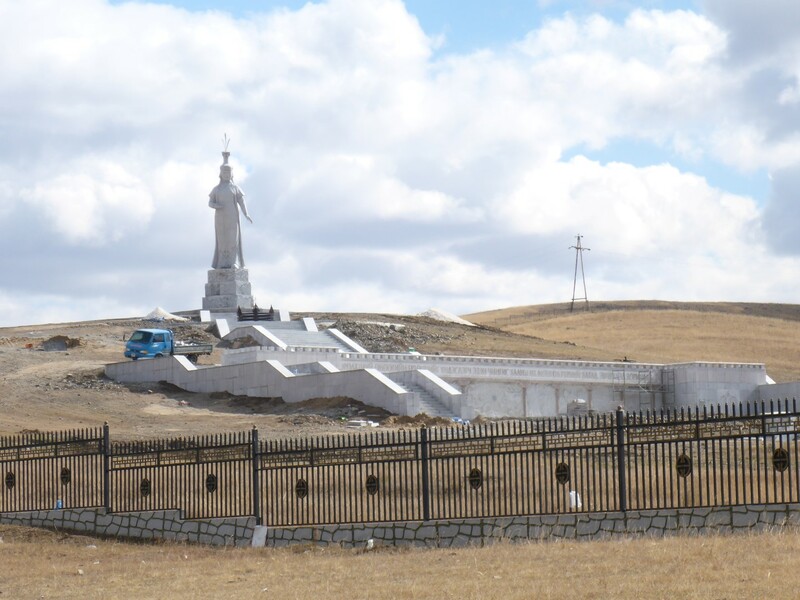 Along with the post communist awakening, I think many Mongolians have relearned the value of understanding their heritage while also taking advantage of the modern world. In the capital the modern world is everywhere and I didn’t see so much evidence of heritage as people went about their daily business. Even the people looked different, with paler skins and finer features. The results, I’d guess, of a few generations of city living, out of the wind and the weather. There are plenty of Europeans around the city too and also Koreans. That country is one of Mongolia’s main trading partners so it’s no surprise. One thing I did find was common between the city and the country towns was that many of the shops would themselves be full of smaller shops, specialising in various goods and services, and usually run by women. As was the hostel. So I think I know where lies the main modernising force in Mongolia. When I left the city next day I had another cold ride to the border. Getting across was straight forward but took a long time. There were queues of cars and vans, most of them Mongolian. I think there must have been a staff shortage on the Russian side because the main hold up was with them. 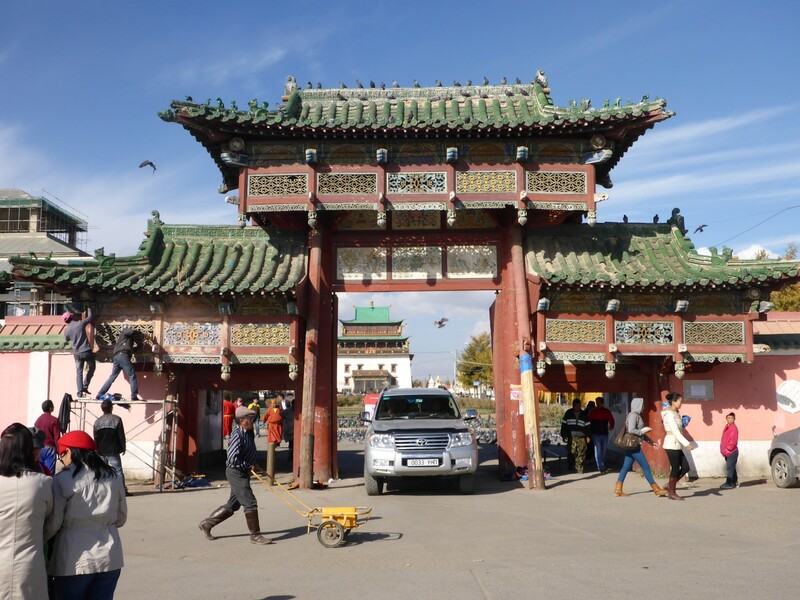 Getting out of Mongolia was easy enough especially when the border staff kept waving me forward past the queues. I was very amused by the Russians who weighed the bags of clothes that the Mongolians had in their vehicles. I had seen some of them adjusting their dress while I was waiting and it was obvious they were wearing several layers. I’m guessing they were taking clothes across to Russia with the intention of selling them and the weighing of bags was the guards’ way of placing a limit on the amount. Once back into Russia my next destination was Ulan Ude, a city that was close to Lake Baikal. I knew I wouldn’t get there that day but I pressed on, hoping to find somewhere to stay in one of the towns. And that is exactly what happened although most definitely not in the way I’d planned. 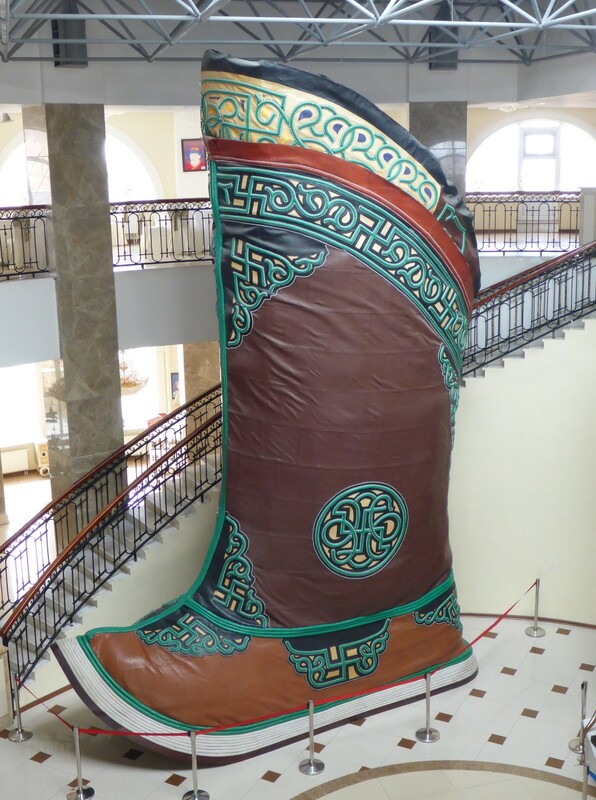 Traditional Mongolian boot, made from hundreds of cow hides. Hi Benno, good to hear from you. I’ll be back in England for a holiday from my ‘holiday’ in April. I hope to catch a game or two before I fly out to Australia. I sincerely hope I won’t be watching a relegation battle! Hi Geoff, what can I say?? Another great report from you on your travels. As always very interesting and enjoyable. Brilliant post Geoff. Fascinating history of the country coupled with some adventurous riding. I loved the heath Robinson repairs to your screen and hope you can come and see us to do some of my DIY jobs when you get back! All those years of doing roadside repairs for other people finally pays off! Cable ties and gaffer tape – how would we manage without them. I’m loving NZ Dave, fantastic place. Thanks for your comments Paul, good to hear from you. Great blog Geoff Wonderful experiences, enjoy reading about your adventures, thanks Keep going. Your 2015 blog is just as good as your 2014. I think you could have been (still could be) a travel journalist. Fascinating stuff. Thanks Graham and OJ. Re. 2015, I’m actually still in 2014 on the blog. Which brings me to a second point – I’d never meet the deadlines!! But thanks very much for the kind comments, they’re much appreciated. Excellent read as always Geoff. Much respect !! Cheers Pete. I hope all is OK with you mate. Just back from my own sojourn of two months and was ‘delighted’ (yup) to see this latest posting. My dealing with Indonesian processes and ‘corrupsi’, whilst an adventure for me, pails into insignificance when reading of your trials and travels. Your determination, confidence and versatility are enviable. I know that your actual journey is well ahead of your journal deadlines here so, apart from looking forward to your next post, I hope you are enjoying NZ (if that’s where you still are) along with some English speaking, like-minded company, and some down-time from all of those challenges. Great read again. Thanks for keeping us all enthralled, and from keeping me from mowing that lawn again after all our recent rain. Really good to hear from you and I’m glad you had a good break. I’ll be going to Indonesia so your advice will be valuable when the time comes. I’m really enjoying NZ. Lovely scenery, very friendly people and it’s good to be warm again. I’ll be here until early April. My plan is to put the bike on a ship to Aus, either Sydney, Brisbane or Melbourne, and while it’s en route I’ll fly back to the UK for a holiday. I expect to be in Aus for a year. I’m looking forward to meeting you.